A beloved classic toy gets an exciting new twist with this deluxe pounding bench. 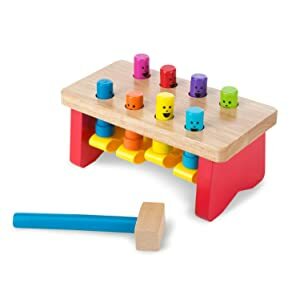 As the colorful, non-removable pegs on the bench go up and down, they play peekaboo, taking turns showing their friendly smiles while the child has fun practicing fine motor skills. And you’ll enjoy that because the pegs are attached, they can’t get lost. A sturdy wooden mallet is included. Children delight in striking a peg with the mallet and watching one on the opposite side pop up. Once a child has seen this cause-and-effect in action, he or she will enjoy predicting which peg will pop up next. 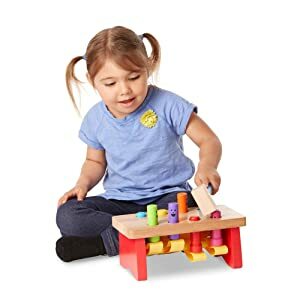 As a child develops hand-eye coordination and fine motor skills, he or she will also be learning numbers and colors by counting the pegs and naming each color as it pops up.